We are excited to share some significant updates for the Nautilus LifeLine Marine Rescue GPS. Press and hold the yellow Nautilus GPS Test Button for 8s. After 3s of holding the Test Button, YELLOW indicator will begin flashing for the next 5s. After 8s, YELLOW indicator will briefly become solid again and then resume flashing. The Test Button can now be released. YELLOW indicator flashes quickly when GPS location determined. Nautilus GPS will now continuously transmit a Non-Emergency Position Report. This message will be received by all surrounding ships with AIS receivers. In addition, if you have programmed a ship MMSI (see page 7), the message will be received on the ship’s VHF radio. Hold Test Button for 5s to deactivate Non-Emergency Position Report sequence. YELLOW indicator will turn solid and BLUE indicator will begin flashing. This sequence will not send an emergency distress message. Our current units, with the upgraded firmware, now also ship with a small screwdriver to assist in battery changes. If your unit did not ship with a screwdriver there is a firmware upgrade available to you. The upgrade will cost $35 USD + one-way shipping. We will cover the cost of shipping back to you! The upgrade includes updating to the latest firmware, new antenna retainer, screws, screwdriver, and o-ring maintenance. To get started with the upgrade process, please complete the form below. We will get in touch as soon as possible and provide instructions for return. Questions, concerns, or comments? Please get in touch with us. We would love to hear from you! Let’s make sure you are safe where ever your diving adventures take you. From now until Dec. 31, 2018 use the discount code HOLIDAY to receive $50.00 off your Nautilus Marine Rescue GPS. * Limit 2 per customer, regular terms & conditions apply. 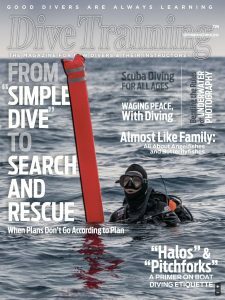 We are glad to be included in the feature article of Dive Training magazine’s September/October 2018 issue. The double feature article written by Karen Straus covers numerous aspects of diving safety, and includes words of wisdom from experienced dive professionals. Read the full September / October 2018 issue at DiveTraining Magazine’s website. Dive safe. Always dive with a Nautilus LifeLine. Firmware 1.02 has a number of notable changes over previous versions. Some customers have received units shipped with 0.94 and 0.96, and these should also be updated to the latest version 1.02. Please check with your dive buddies and make sure they have updated to the most recent firmware too. Complete overhaul of the user interface (UI), making accessing and changing settings significantly easier and more intuitive. Read the Operations Manual updated December 2013, and the section “New Firmware Features – Firmware Newer Than 0.80”, on Page 12 in the English version. Continuous Position Report mode from the Red button, previously selected from the desktop software, has been removed. The DSC button now has only one purpose.Single position report messages can still be sent from the Messages sub-menu. DSC Messages can be sent and reviewed from the Messages menu. Press the Orange button once to enter the menu, the Green button three times to get to Messages, and the Orange button to enter the Messages sub-menu. Added a Distress Simulation mode, and SOS Flash, accessible from the Procedures sub-menu.